Earth is Our Planet, Too! The goal and purpose of Earth is Our Planet, Too! 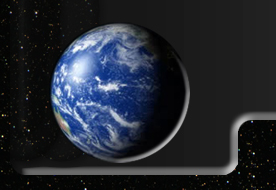 is uncovering the hidden history of Earth. Chapter One covers the long history of the Jersey Devil, and the wide variety of people from all walks of life who saw this creature in New Jersey and the neighboring states. Many people have tried and failed to discover its origins and its identity has remained a mystery. A possible resolution of what the Jersey Devil is comes from the ancient writings of a highly unlikely source: a Catholic Bishop from Germany. Taking this new research approach paid off for Steve Pearse because this remarkable information soon provided amazing insights to resolve other mysteries that have baffled mankind for thousands of years. 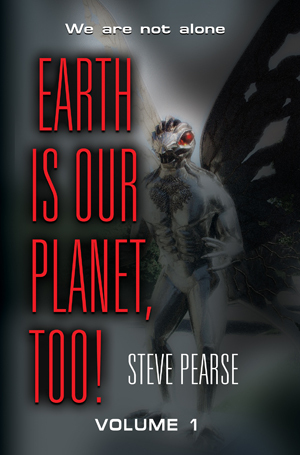 Author Steve Pearse investigates mysteries such as the Mothman, the Snallygaster, the Piasa, the Native American legends of the Thunderbird, and the Van Meter Visitor. Discoveries came about by paying close attention to many fragments of history and mythology. The truth became self evident as the puzzle pieces came together to finally reveal the identity of the “demons and monsters” of Earth. Nearly all of the dinosaurs died out 65 million years ago, but some of them evolved becoming Theropods - primitive dinobirds. Editor’s note: There is an uncanny resemblance between some of the descriptions and accounts provided in this book to beings who appear as Reptilian, Draconian and Mantis or Mantid-like in ET Contact reports. As a fellow Fortean and life-long enthusiast of the unexplained I cannot begin to thank Mr. Pearse enough for the pleasure of having the honor of reviewing his book Earth Is Our Planet, Too! Volume I. With topics ranging from The Jersey Devil, Thunderbirds, Mothman, The Van Meter Visitor to name a few, this book was a real tour de force from beginning to end for me. I was thoroughly engrossed in the reading from the first chapter. Not only was this book well researched with the accompanying information but it truly does make the reader ponder just what might else could be out there in the darkness, in this vast world of ours. Did I say ours? Maybe a better quote would be “it might not be ours to begin with,” or in the very least we are sharing it with some incredible, mischievous and at times terrifying ‘others’. I don’t know if I am really qualified to review Steve Pearse’s book being that over the past 50 years my primary interest has been studying and researching the UFO/ET phenomena. However there is considerable overlap between UFO/ET phenomena and Cryptozoology especially with researchers like John Keel who were active in both fields. Steve thinks a lot of John Keel and dedicates this book to him. Steve does get into paranormal phenomena around the Mantis-Grey ETs that who in my opinion are predatory and it’s my opinion that some of this Cryptid and mythical creatures may be something of their doing to destabilize humans and their hold on physical reality toward their own predatory ends. I suspect this could be done via virtual reality projections onto normal human perceptions. Anyhow, I am thankful that Steve sent me his book for review because I would not have normally waded in very far into Cryptozoology and would have missed some good stories or encounter cases such as the Jersey Devil, Mothman, the Thunderbird of Native American mythology and dragon mythology in Asian and Europe. Steve seems to think that there is some actual physical basis behind the stories of mythological creatures and may not simply be imagination and storytelling. Maybe the physical world that we perceive is not quite as solid and inflexible as we might think. I am willing to keep an open mind on that after storytelling and hoaxes are weeded out. In August, 2011 Steve was diagnosed with stage three Cancer (Non-Hodgkin’s Lymphoma) and with time on his hands between chemotherapy treatments that eventually resulted in remission. He took this time to pursue his interest in Cryptozoology interestingly starting with an interest in the Praying Mantis Alien. I’m discussing with him via Facebook my theory that some of these strange reported creatures could be tied to the Mantis-Greys who are known to project screen memories and to even appear as owls and deer to those humans they abduct. This idea technological virtual reality projection he told me had not occurred to him until I mentioned it. It has been suggested by some researchers that these aliens are predatory and may create fear, anger and violent polarization in humanity to feed on it in some way or use conflict toward their own present and future ends. The people that see these strange creatures most often become very afraid. Of course people like to invent stories to scare themselves, but perhaps there is more to this than meets the eye. Maybe Steve will dig into this in future volumes of books he is writing. I really found the Native American history of the Illinois Piasa Petroglyph to be very interesting (a kind of winged man eating bird or dragon) that was painted on a high cliff along the Mississippi River that was pretty much obliterated by 1700 by Indians shooting at it as they passed up and down the river. The Indians believed it interfered in at least one of their numerous tribal wars carrying off the leaders of the Miami and so demoralizing the Miami that they were routed by the Metchigamies. 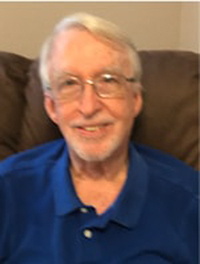 Steve Pearse served four years in the military with the United States Army Security Agency 77th SOU (Clark Air Base) with a top secret teletype crypto clearance. He is now a lay scientist, e-book author, and a retired business professional with over 25 years in the field of credit management and account reconciliation of State, Federal, and Mass Merchandiser accounts. As a lay scientist, Steve uses his strong analytical and research skills in studying the Extraterrestrial Hypothesis; specifically the question humanity has been asking for thousands of years: Are we alone in the Universe? In 2000, Steve Pearse came to the conclusion that many so called anecdotal accounts involving UFOs – which were often dismissed in the media as unreliable testimony – were actually true. 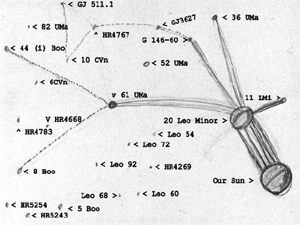 A turning point came when Steve stumbled across shocking new information relating to Betty Hill’s Star Map, which in turn led him on an exhaustive eight year investigation into the Extraterrestrial Hypothesis. 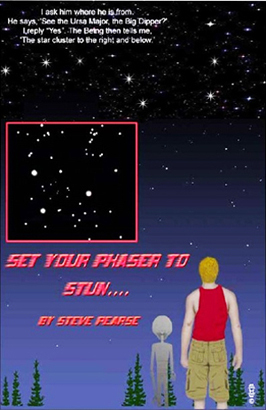 The culmination of Steve Pearse’s research resulted in his book, Set Your Phaser to Stun.